Lancaster Food and Drink Festival (in association with Budweiser Budvar) is now in its seventh year. Over the last six years the organisers at Lancaster Brewery have welcomed over 45,000 visitors through the gates over the May bank holiday weekend and this year was even better and bigger than before. Waistbands weren’t the only thing increasing as this year’s food lovers paradise expanded to three full days across the bank holiday and saw a record number of stalls holders, as well as record temperatures. Once again, the whole event was FREE of charge with FREE and ample parking. Over the three days, over 60 high quality food and drink producers created a haven for foodies alongside children’s activities, play areas, face painting and magic. 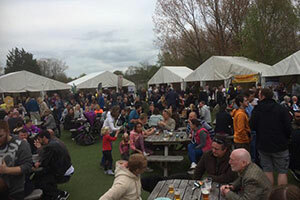 It was a fantastic atmosphere with lots of people relaxing in the brewery garden, enjoying the amazing weather and live music. Thousands of visitors enjoyed the demonstrations, advice and free samples from stalls showcasing meat, pies, biscuits and cakes, as well as artisan spices, oils, chutneys and relishes. Local food was proudly on the menu, with the yummiest Lancaster and North-West produce, from farm-fresh chops and cheeses to local seafood and salt-marsh lamb. There was also increased multicultural cuisine on offer, with international inspiration from stalls selling Jamaican, Spanish, Indian, Greek and Thai foods. The succulent street food kept visitors fuelled with an abundance of juicy burgers and pulled pork, pancakes, paella, oven fired pizzas, sausages, wraps and Tacos. Refreshment of the liquid variety was eclectic with flavoured gins and sparkling wines, alongside craft ales and freshly squeezed juices. On Bank Holiday Monday, Shelley Booth and John Barnes from Radio Lancashire broadcasted their afternoon show live from the festival. Throughout the weekend, the team at Lancaster Brewery put on fantastic entertainment including local bands and vocalist Paul Akister. So that's it for another year. Next years dates have been confirmed as Saturday 4th, Sunday 5th and Monday 6th May. It’s bank holiday weekend and the festival will be open from 12noon – 6pm. See you there!